Nouba - Brush n° 53 - 08353Retractable brush for blushes and powders in general. The natural bristles are soft and silky, in order to allow easy and uniform application. The generous shape perfectly follows facial features. The retractable construction makes it a practical accessory to carry with you. Rinse regularly with warm water and neutral soap, let dry in a horizontal position. 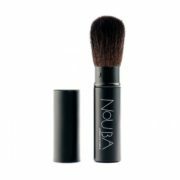 Take a small amount of product and shade with the brush, gently following facial features.